The world of plant life holds limitless possibilities for any Witch willing to learn its secrets. While the trees, shrubs, flowers and “weeds” we see all around us may seem ordinary to the novice, they are actually very potent tools of magic. The inherent magical power of herbs comes directly from the source of all creation, and it has the potential to transform our lives. 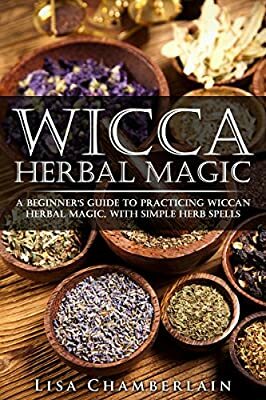 For Wiccans, herbal magic keeps us literally in touch with the energies of the Earth, along with the Sun, the rain, the wind, and every living thing that sustains the cycle of life and death in all of its forms. When used wisely, herbs can help us create what we desire, in matters of love, health, wealth, and more. Of course, working with herbs is a tradition much older than any known form of Wicca or other Witchcraft. Since the beginning of human history, healers, shamans, and other medicine people have understood the nutritional, medicinal, and magical properties of herbs. Now, Lisa Chamberlain brings this knowledge to modern Wiccans, Witches, and others who are interested in practicing this diverse form of natural magic. Whether you’re well-practiced in other forms of magic but are just discovering herbs, or new to magic altogether, Herbal Magic provides an excellent place to begin your magical journey. Many books on magical herbs contain extensive lists of ingredients that may be expensive, difficult to find, or both. Unless you already have a well-stocked herb pantry, trying to decide where to start can be overwhelming. In addition, some books provide spells that call for just a pinch of a rare herb you have to order online, which can be rather inefficient—especially if the herb only appears in one spell! The spells in Herbal Magic are all centered around the same 13 herbs, most of which are inexpensive and easy to find. Most are also culinary and/or medicinal herbs, so you’ll have plenty of options for using anything leftover from your spellwork. This approach to the subject makes it easier and far more efficient for you to get your herbal practice underway! By the end of this guide, you’ll have a solid foundation from which to build your own practice of working with magical herbs. The more you learn, the more you’ll realize that the possibilities presented by this form of magic are truly endless! If you're ready to begin working with magical herbs, scroll to the top of the page and select the buy now button. Readers will also be treated to an exclusive free eBook!